As far as unlikely places for an AA meeting go, the fairgrounds of the Coachella Valley Music and Arts Festival have to be pretty high up on the list. But "Soberchella" has set out to change that, offering AA meetings and a haven for sober attendees amidst all the day-drinking, weed smoking and pill-popping that&apos;s often synonymous with the music festival experience. In early 2009, Bob, who&apos;s been sober for 14 years, starting poking around online for resources for those who would be attending the festival sober, and found that they were in short supply. He and his wife, who is also in recovery, "figured that if we were doing this, other people must be too." Bob told LAist that the seeds for Soberchella were planted when he posted on a festival message board looking for other sober attendees. He connected, as he put it, "to one person and then another, and then another." By the time he arrived at his first Coachella, he was already in touch with somewhere between eight and 12 other sober attendees. They held their inaugural Coachella AA meeting at noon on the first day of the 2009 festival. Soberchella, which has no official affiliation with the festival, has grown in the years since. Bob estimated that 30 active participants attended meetings during the first weekend of the 2016 festival. Part of the appeal, he said, is not just having access to AA meetings on-site, but also finding a way to connect with other festivalgoers in recovery. Soberchella typically hosts one large noon meeting and a smaller meeting in the evening, but Bob said lots of smaller meet-ups also happen during the day. "Sometimes it&apos;s just seeing a set together, or going to grab a bite of food." "There is strength in numbers," Bob said. "We all knew that if anybody got uncomfortable, we were out of there." There is obviously plenty of drinking and drugging in the music world, but there is also a long tradition of musicians in recovery. An artist who has headlined a long list of festivals and has over two decades of sobriety told LAist that when he attended Coachella a few years back, he ran into five or six sober friends within twenty minutes of stepping onto the festival grounds. "Obviously, you want to steer clear of temptation," he said, "but you can always ask a sober friend to come with you. It can be done, you can have a blast without getting high or drinking, and, of course, you&apos;ll be able to remember the experience the next day." Another sober attendee said that "actually being present" at the festival was one of the highlights. Ana, a longtime festivalgoer who attended the very first Coachella in 1999, told LAist that she has experienced the festival in both states. She remembers very little of that first Coachella, saying that she was "loaded" at the time and that "the whole era is a big blur." She has attended the festival at least four times since getting sober in 2000, and said that her experience has been great. "I probably have more fun than a lot of people." Getting to a meeting on the fairgrounds without being hassled could provide a challenge for some artists playing the festival while also trying to maintain their recovery, so the Musicares Foundation has long offered a backstage refuge for sober musicians. A "Safe Harbor" tent in the artist compound offers support and twelve-step meetings for musicians, technical staff and other festival crew throughout the festival. "We&apos;re not trying to convince anyone of anything or change their minds," Bob said. "We just want people to know that we are here. It&apos;s for ourselves, and anyone else who feels they need it." Planning to attend weekend two sober? 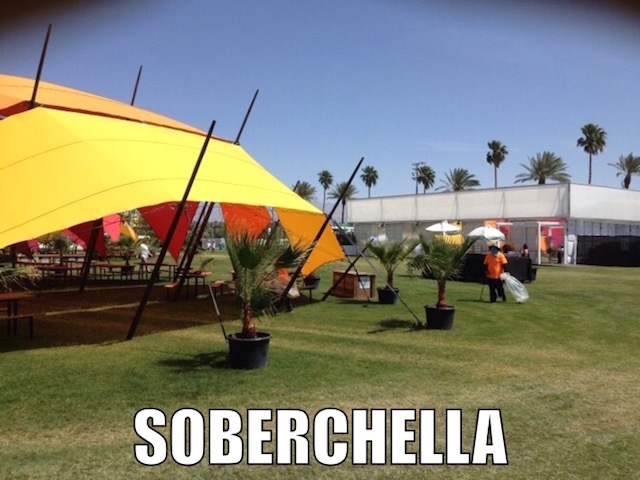 Soberchella will be holding daily meetings at noon (email soberchella@gmail.com for location information). Updates can also be found on their Twitter and Tumblr accounts. Bob&apos;s advice for first-timers? "Put your recovery first and make the effort to connect with other people who are clean and sober. Ensure your sobriety, and then enjoy the experience!" Note: Some names have been changed at the request of interviewees. Here is the preliminary Soberchella schedule for Coachella 2017, courtesy of one of the Soberchella organizers, who writes: "As always we encourage anyone looking for us to contact us at soberchella@gmail.com so we can give them more precise location info and directions, and keep them appraised of any changes or extra meetings we may arrange once on site." Thursday April 13th at 8 p.m.
Thursday April 20th at 8 p.m.